Eurocom has benchmarked X7 gaming laptop with two AMD Radeon R9 M290X graphics cards to show the epic graphics performance of dual graphics combined with the Intel Core i7-4930MX processor. EUROCOM X7 supports two VGA modules via standard MXM 3.0b interface. 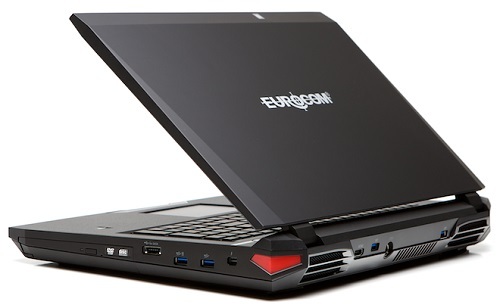 Eurocom is also shipping the AMD Radeon R9 M290X in the 15.6” X3 and 17.3” X5 high performance gaming laptops. The X7 high performance laptop supports beautiful full high definition 1080p 1920x1080 matte and glossy displays with the option to go with a fast refresh 120 hz panel for operation on the go. The custom built, X7 and the entire series of gaming laptops, allows customers to build the exact system they desire with the exact components they need. Performance is unmatched with 4th Generation Intel Core i7 Extreme processors, next generation AMD Radeon R9 M290X graphics in single and CrossFire. Having the ability to add up to 32 GB DDR3-1600 memory via four 8GB SODIMM 204 pin modules ensures nothing will slow these gaming beasts down. To store the latest games and software the X series supports up to 5 storage drives, with 2 mSATA solid state drives waiting for fast boot up times and blazing responsiveness.